These incredibly delectable and succulent grilled fruit skewers will please the pickiest of eaters, and making them is super simple, even kids can help cut the fruit and thread them on the skewers. Of course, they will pounce on them as they come off the grill, so be sure to let them chill a bit before biting into. They say that peaches are a symbol of immortality and friendship, and we do like to share them with friends, so at least one symbol can be considered the truth. Peaches are also touted to be a stress-reliever, they can calm an upset stomach, they are thought to be an aphrodisiac, a kidney cleanser, full of vitamin A and C they help to regenerate skin tissues and they help us fight cardiovascular disease. And they are best fresh, so when peaches are in season, buy a bunch and make some green iced tea with peach to wash down another summer favorite: pork chops with BBQ peach sauce. 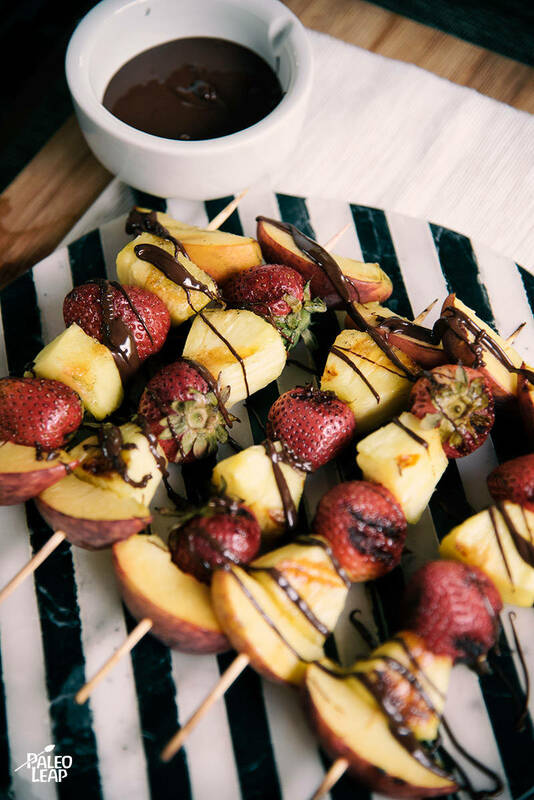 For an extra indulgent take on these grilled fruit skewers, go ahead and drizzle some dark chocolate over the fruit once they are on plates and ready to be served. Not sure what chocolate is Paleo-friendly? Seek out quality chocolate with a minimum of 80% cacao and just a small amount of sugar; if you can find certified gluten-free, non-GMO verified or vegan chocolate, embrace and appreciate it for the delicious sweet treat that it is. If a cinnamon and honey glaze suits your sweet tooth better – combine 1/4 cup of honey, a teaspoon of lemon juice and as much cinnamon as you like, drizzle over the skewers as you would the melted chocolate. Skewer the peaches, strawberries, and pineapple alternating on the wooden skewers. Lightly brush the fruit skewers with olive oil, and lightly season with salt to taste. Place on the preheated grill, and grill 5 to 8 minutes turning every 2 minutes. Serve the skewers with melted dark chocolate if desired.